Spotless freshwater sundancer with 7.2 KW Genset, complete Raytheon electronics package including Ray Pilot 650 Autopilot, R41XX Radar, 601XX Chartplotter, GPS, Depthsounder, and VHF. Also, equipped with engine synchronizer, remote windless, remote controlled spotlight, power helm seat, wet bar, and ice maker. 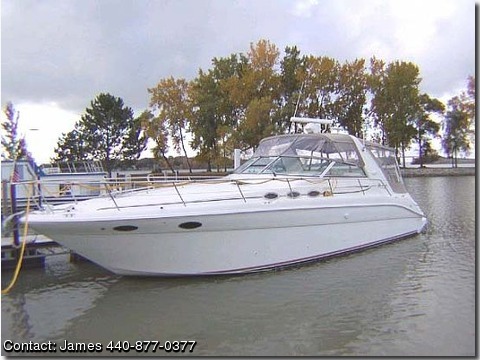 Below deck options include: Microwave, Built-in Coffee Maker, CD Changer, Upright Norcold AC/DC Fridge and Freezer, Glasstop Electric Range, Central Vac System, and Central AC Units with Reverse Cycle Heating. New Batteries, new Custom Camper Canvas/Glass, and new Carpet Runners.